With this exclusive offer from Rewarding Times you can enjoy a three course lunch for two people with a carafe of house wine at La mere Zou. La mere Zou’s solidly French style of classic bistro cuisine has made it one of Dublin’s best loved restaurants over its 18 years of business. Located on St. Stephen’s Green, the restaurant is only a two minute stroll from the top of Grafton Street and Dawson Street and close to the Shelbourne Hotel and National Concert Hall. 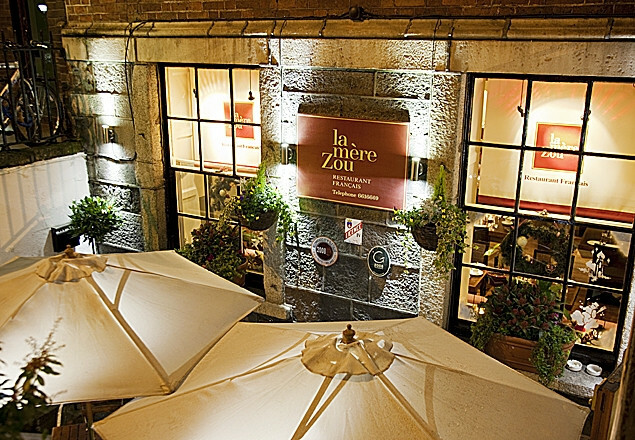 La mere Zou is has an intimate atmosphere perfect for business or casual dining; there is a semi-private room that sits eight comfortably. It’s slate and granite south facing terrace allows for sunny al fresco dining delivering an authentic continental experience in the heart of the Irish capital. The kitchen is led by the young and very talented Graham Dodrill who makes the classic French cuisine more approachable for today’s diner by using leaner meats and lighter sauces. Dishes are seasonal and include game and slow cooked meats as well as plenty of seafood. Front of house is over-seen by the very capable Frederic Dreno, a sure source of good advice on what wine is best with each dish. Owned by Belgian Eric Tydgadt, La mere Zou also offers a great list of fine continental beers by the bottle. Vouchers are valid Monday to Saturday for six months excluding the month of December. Lunch is served Monday - Friday between 12pm and 2.30pm & on Saturday's from 1pm to 2.30pm.